The collection includes two award-winning pieces. For short story enthusiasts, a collection to keep them engrossed! 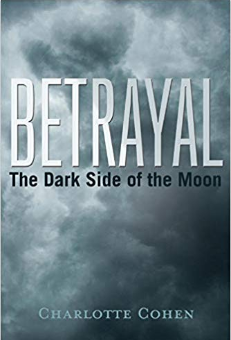 Short story writer Charlotte Cohen compiled a few of her finest works in one compact collection titled “Betrayal: The Dark Side of the Moon” (BookBaby; 2018). “After having written several of my short stories, I realized that betrayal in various ways was a common element—thus the title of the collection,” said Cohen about “Betrayal,” which contains 12 short stories, all similar themed. In “Betrayal” are two pieces that won the author awards in the Writer’s Digest Annual Writing Competition: “Domestic Bliss” and “A Wrong Turn.” “Domestic Bliss” is just one of the four stories – along with “Outcast,” “Twins,” and “Stanley and Maude” – that deal with husband and wife relationships. “A Wrong Turn” is about four friends that made a deadly wrong turn while driving in the Mojave Desert and is based on one of the author’s bad dreams. Order today through Amazon and Barnes & Noble. Await the display of this engrossing read at the upcoming Los Angeles Times Festival of Books on April 13-24, 2019 at the University of Southern California in Los Angeles, CA.